Tracksounds: Tracksounds is Twitcasting...err Twitcamming? 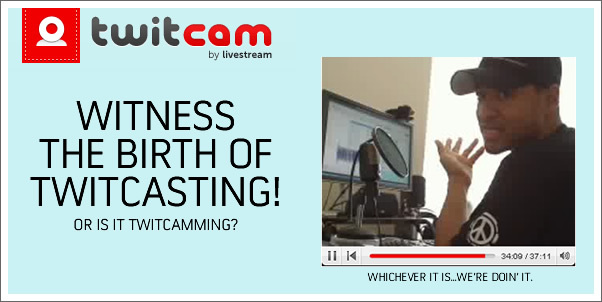 Livestream (a great company with a great webcasting product) just released TWITCAM today. It's a very interesting idea and simple way to do a video webcast via your twitter account. As a bit of a test, I did about 30 minutes worth of "twitcasting" today...just to see how it all works. To keep it from being just me staring blankly into the webcam, I decided to give you a behind-the-scenes glimpse of me editing an upcoming interview. Ooooo! I know. Now, before you finish your *yawn*, you do get to hear a few significant segments of the interview with SASCHA DIKICIYAN and CRIS VELASCO on their recent project PROTOTYPE. Not only that, but you get to hear a few bits of the score itself. I also talk a little bit about why our High Score update has been delayed so long. Anyway...check out our first Twitcast...and if you start twitcasting be sure to let us know. We'll watch. You can find our Twitcast page here, but whenever we do cast...it will be auto-tweeted so just follow us to be notified of our next cast! Let me know what you think about the twistcast.